A new super-fresh seafood restaurant is due to open in Crouch End next week. Matthew’s Kitchen – a new venture from established Chef Artur Rrakaj – will serve seafood sourced direct from London’s Billingsgate market to Crouch-enders long-starved of a fish and seafood offering. MK’s emphasis will be on freshness, quality ingredients and value for money. Wines will be sourced from Laytons wine merchants in Islington and bread from Dunns in Crouch End. 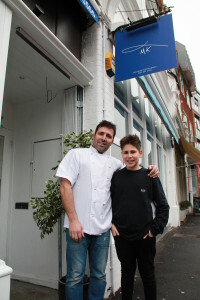 Mr Rrakaj, who worked for nearly twenty years in high-end restaurants and hotels in London and the US, has named the restaurant after his son, promising to do so when Matthew was a small boy. Chef Rrakaj has cooked for the Queen and Prince Phillip, but also for football royalty at executive boxes, including at Highbury and Stamford Bridge. The menu will feature classic fish and seafood dishes with a twist, such as whole grilled lobster with garlic butter, grilled fillet of sea bass, Scottish scallops as well as cod, paella, oysters and mussels. For meat eaters there will be lamb from Romney Marshes and vegetarian offerings too. Artur said: “I am very excited to bring fresh fish to the Crouch End masses. It’s a difficult skill to perfect, but when you get it right, fish and seafood can be great and it’s healthy too. I am hoping to make Matthew’s kitchen North London’s number one seafood destination”. Matthew’s Kitchen opens on Monday March 9th and will open seven days a week for lunch (12-3pm) and dinner (from 6pm), and for brunch from 9.30am on weekends. I agree with the first review and we did find the portions were on the mean side. Especially the fish cakes! They were tiny and more like a starter course……. It was my mothers 93rd birthday and the atmosphere and service were lovely……. I do wish you well and will be trying again perhaps tonight as we would like a fish dinner. Hopefully perhaps you are more in the swing of things now….. I wish the restaurant well but there’s a lot of room for improvement, based on a recent visit. The food is reasonably good but not earth shattering. The portions are definitely on the mean side. Service is pleasant but far from attentive enough. The card machine wasn’t working but we were only told after the bill arrived. It was pitched as if it was our problem to find over £100 in cash.